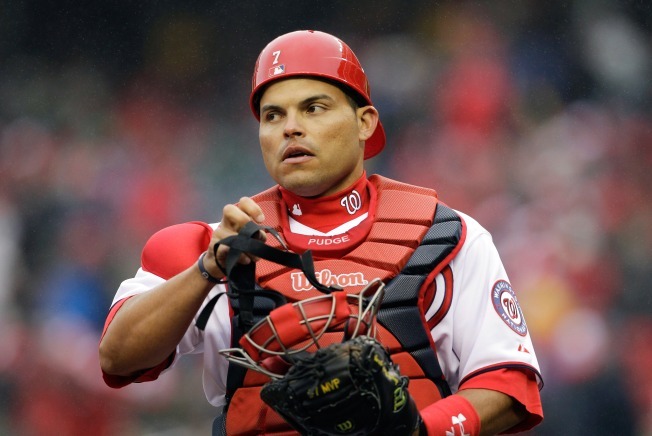 Former Washington Nationals catcher Ivan Rodriguez was among the three former players elected to baseball's Hall of Fame Wednesday. Rodriguez played most of his career with the Texas Rangers before bouncing around for a few season until he finished his career in Washington in 2010 and 2011. Over his career he batted .296 with 311 home runs and 1,332 RBI. He was a 14-time All-Star, 13-time Gold Glove winner and the 1999 American League MVP. He won a World Series with the Florida Marlins in 2003, when he was the MVP of the National League Championship Series. He was behind the plate for Nationals pitcher Stephen Strasburg's Major League debut in June 2008, when he struck out 14 batters and walked none. Also making the Hall was Tim Raines, who played 13 years with the Montreal Expos before they moved to D.C. and became the Nationals in December 2004. Another player who started his career in Montreal, Vladimir Guererro, fell 15 votes short of reaching the Hall. The third player elected Wednesday was Jeff Bagwell.